Whether you’re buying from a registered dealer or a private seller, there are various precautions you should take when buying a used car. Our guide reveals the top tips for buying a used car and ensuring you know what you're getting and what price you should be paying for it. A study by the Office of Fair Trading found that consumers buying a used car lose an average of £425 each – or £85 million per year in total – through having to fix unresolved faults that are the dealers' obligation to correct. Not taking the right precautions and doing all of the required preparation and checks could cost you a lot in repairs, time and effort. The key to finding the best used cars is to do your research and take the steps below, including a vehicle history check. Read our 11 point checklist to see what to look for when buying a used car. A car history check is vital when buying a used car. You can use it to find out if it has any outstanding car finance, is recorded as stolen, or has previously been written-off. There are many companies offering history checks for varying fees, but not every one will provide all the information you need. Many of the cheaper used car checks will not show whether the car is subject to a logbook loan agreement. A single car check with vehicle history checking company HPI costs around £20 and is the most comprehensive check available. Taking home your new car only to find later on that the vehicle was registered stolen and thus needs to be taken away for investigation is a nasty experience for any new vehicle owner to go through. If you buy a car that's under a logbook loan agreement you'll find that you don't own the car at all, and you could even become liable for the previous owner's debt. Your purchase is unlikely to be protected so there would be no legal obligation to have your money returned to you. The only exception is if the purchase was made on a credit card, however not many used car dealers accept credit cards. A used car check is certainly worth the relatively small fee. If you choose to not get one then weigh up the possible cost of any scenarios where the car has issues you did not expect. To avoid being overcharged, find out the market value of the car you’re looking at by checking price guides and comparing similar used cars for sale online and in car magazines. The car dealer or the second-hand seller may also try to play down blemishes or anything that may seem to suggest something wrong with the car, so do your research, check the car's history, and get a good view of the car (see next point). Arrange car viewings for the day, and at the seller’s home if possible. Try not to go when it’s dark or raining as this can hide defects, such as dents and scratches. 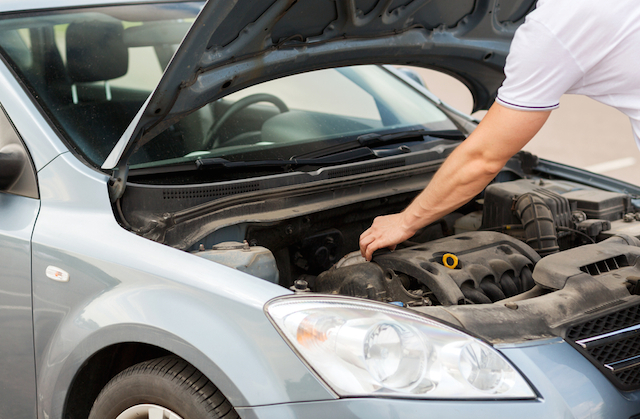 Check beneath the car and under the bonnet for rust and any signs that the car’s been in an accident. Ensure that the seller knows the vehicle and its features well by asking to see its service history and previous MOT certificates – if they don’t seem to know much about the car and its history, it could be a sign the car’s stolen. If you have doubts then get a vehicle history check to avoid going through a costly process later. Ask the seller to show you the car’s V5C registration document, which gives details of the registered keeper and all previous keepers. The Driver and Vehicle Licensing Agency (DVLA) started issuing new look red V5Cs from late 2010, and there should be no legitimate blue V5C documents still in circulation. When viewing a used car, look for its VIN (Vehicle Identification Number), which can usually be found at the base of the windscreen, under the bonnet, and stamped into the framework under the carpet by the driver’s seat. Make sure it matches the VIN found in the V5C registration document. See if the locks are different from one another, as changed locks could indicate that the car’s been broken into before. Keep an eye out for any signs of forced entry and make sure all the windows, including any sunroof, open and close normally. Check that the mileage doesn’t look too low for the age and appearance of the car – if it does, the odometer may have been tampered with, known as ‘clocking’. A clocked car is one where the miles have been wound back to increase apparent value and asking price. Every 1,000 miles removed increases the value considerably. A ‘cut-and-shut’ is where pieces of two or more vehicles, often ones damaged in crashes, are illegally welded together. Pull up carpets and trims for signs of hidden welds and look for poor paintwork or colours that don’t match properly. A full history check before buying a used car will show if the car’s been stolen or written-off – a cut-and-shut could be both. Check the condition of the tyres, noting the tread depth and side-wall damage. Tyres with uneven wear could mean that the wheels aren’t correctly aligned. Before taking a test drive, make sure you’re insured. Check your car insurance policy to see if it says that you can drive another car with the owner's permission – this is known as DOC (Driving Other Cars) cover. Allow at least half an hour, and drive at different driving speeds noting how the steering, brakes and gears handle. Listen out for any odd noises and check the electrics.